Dale B. Taylor, PhD, MT-BC, is Professor and Chair of the Department of Allied Health Professions at the University of Wisconsin-Eau Claire, Director of the Music Therapy Program, founder of the UW-Eau Claire Music Therapy Clinic, member of the International Relations Committee of the American Music Therapy Association, Co-Chair of the Wisconsin Turning Point Transformation Team of the Department of Health and Family Services, member of the Board of Directors and formerly Secretary/Treasurer of the International Arts Medicine Association. He has served as President and Vice-President of the Great Lakes Region of the National Association for Music Therapy, as Editor of the International Journal of Arts Medicine, on the boards of Music Education for the Handicapped and the International Association of Music for the Handicapped, and chaired the founding meetings of the Wisconsin Chapter for Music Therapy. 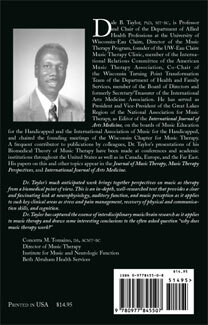 A frequent contributor to publications by colleagues, Dr. Taylor’s presentations of his Biomedical Theory of Music Therapy have been made at conferences and academic institutions throughout the United States as well as in Canada, Europe, and the Far East. His papers on this and other topics appear in the Journal of Music Therapy, Music Therapy Perspectives, and International Journal of Arts Medicine. Dr. Taylor’s much anticipated work brings together perspectives on music as therapy from a biomedical point of view. 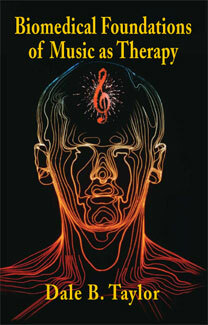 This is an in-depth, well-researched text that provides a clear and fascinating look at neurophysiology, auditory function, and music perception as it applies to such key clinical areas as stress and pain management, recovery of physical and communication skills, and cognition.